Have you ever gone in the woods, not to hike but just to be? When was the last time that you just sat in nature, with no phone, no friends and no agenda? When we are busy racing around most of the time, it’s easy to forget to take a break and slow down. We may have become so accustomed to rushing, so immersed in the culture of speedy everything, that we no longer know how to stand still. While living in the fast-paced concrete jungle of modern urban life with its 24/7 connectivity to screens and social media, choosing to consciously unplug and spend time with the trees, earth and sky is a spiritual medicine. Forest bathing is more than just another self-care trend, it is an age-old practice of healing in the fresh air, mindfully spending time with Mother Nature. The idea is that when humans spend time in a natural setting, especially under a lush forest canopy, we experience rejuvenating benefits to the mind, body and spirit. This is not a new concept. Traditionally, countless generations of human have sought the restorative benefits of the forest in everyday life. Of course, over the millenia, with the increase of industry and modern civilization, we moved away from the forest and into the hustle and bustle of the city. We lost touch with nature. This simple guide will define forest bathing and explain how to use it as a method of stress reduction. Forest bathing is the simple practice of connecting with nature with the intention of improving health. The technique was first developed in Japan in the late eighties and coined shinrin-yoku. It is a popular leisure activity in Japan to this day and is increasingly catching on in the West. While the walks are essential, there are other core activities that can be included in a routine designed to deepen your relationship with nature. It’s really about exchange of health benefits between humans and the natural-world, which are interrelated and not actually separate. The practices of sit spot, place tending and cross-species communication are commonly included in a guided forest therapy session. 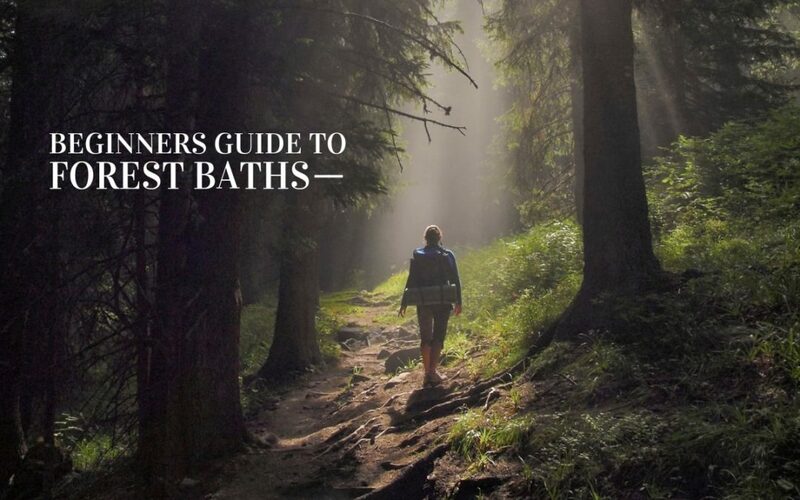 A forest therapy program can include guided walks and even doctors present to offer health assessments, or you can forest-bathe independently. Forest therapy prioritizes sensory experience over intellectual. It’s not so much about learning as simply experiencing, or being. Unlike most approaches to nature education, trained forest therapy guides are more concerned with nurturing curiosity and asking good questions than with sharing facts and imparting naturalist knowledge. There are endless activities that can be performed in the forest to enhance relaxation and connect deeply with nature, such as mindful walking, yoga, mindful eating, hot-spring therapy, T’ai chi, meditation, breathwork, aromatherapy, writing, painting, drawing sculpture and plant observation. An activity is likely to be healing when it makes room for awareness, quiet and presence and inquiry through as many sensory modes as possible. Forest bathing is suitable for people of all ages and any level of fitness. In forest bathing, we do not consider forests to be a “resource” from which well being is extracted by humans. On the contrary, it is a deeply relational practice, characterized by a sense of loving and compassionate connection between individuals and trees, animals, rocks, etc. This connection naturally cultivates love, gratitude and reciprocity. Forest therapy is about creating relationships between humans and the natural world that empower healing and serve as a potent source of well-being. Forest bathing began to take root [pun-intended] after research showed it to have proven health benefits. A great deal of scientific evidence exists to support the health benefits of spending time in nature. Because of this, forest bathing became an integral part of preventive health care and healing in Japanese medicine. Spending time in nature and effectively reducing your stress level allows your mind to function more clearly and creatively. It can also enhance your mood, give you laser-sharp focus and uplift your energy. Breathing the natural essences that trees release into the air can actually help boost our immune system. By reducing high stress levels that can compromise the effectiveness of the immune system to fight off disease, you allow the body’s natural defense system to work its magic. As well, people who spend time in the forest have a reduced risk for heart conditions, skin conditions and asthma. One study found significantly decreased levels of hostility and depression among the research subjects who spent a regular amount of time in forests. Another scientific study found that spending time in the forest can reduce concentrations of cortisol (stress hormone) l, slow down the pulse rate, lower the blood pressure, increase parasympathetic nerve activity and decrease sympathetic nerve activity compared to city environments. Interestingly, forest bathing was historically used as a cure for tuberculosis. In the late 1800s, physicians established sanatoriums in the pine forests of Germany, as well as in the Adirondack forests in upstate New York. All reported benefits from the moist forest air. There was speculation among the physicians of the time that pine trees secreted a healing balm into the air. Forest bathing is a practice, similar to and aligned with yoga, meditation, prayer, exercising, and many other worthy endeavors, more so than a one-time event. Developing a meaningful relationship with nature occurs over time, and the connection is deepened by returning frequently throughout the natural cycles of the seasons. Leave your phone and camera behind. Walk aimlessly and slowly. Let your body be your guide, tuning in and listening to find out where it wants to take you. Go alone, or split up if you are with a group of people. Take your time. There is no goal or destination. The path is the journey. With no specific destination in mind, wander, observe and immerse yourself in nature. Allow your intuition and senses to take the lead and guide you along a meandering path. Follow a trail into the forest. When you have become completely surrounded by nature, stop, close your eyes and engage your senses. The key to unlocking the power of the forest is in the senses and the bodily sensations. Savor the amazing sounds, rich smells and beautiful sights of nature. Let the forest seep into your body, mind and heart. Notice the smell of the earth and the natural aromatherapy of the trees and plants around you. Listen intently to the sound of the leaves rustling in the breeze, the birdsong and whatever other sounds arise in each moment. Observe the feeling of the clothing and the air gently touching your skin. Look at the many shades of green in the trees, and see the sunlight filtering through the branches and the shadows on the ground. Let nature enter through your ears, eyes, nose, mouth, hands and feet. Taste the freshness of the air as you take deep breaths. Hug a tree. Dip your fingers or toes in a bubbling brook. Lie down on the ground. Drink in the forest and feel a growing sense of joy and tranquility. Forest bathing can be done anywhere in the world where there are trees; in the tropics or on the mountainside, and in any weather. You don’t even need a forest. Once you have learned how to do it, you can do shinrin-yoku anywhere – in a nearby park or in your garden. Look for any place where trees live. The ideal method of relaxation varies from person to person. Find a place that suits you. If you love the smell of damp soil, look for a place where the natural landscape provides it. If you have a special place in the countryside that reminds you of your childhood or of happy times in the past, your connection with that place will be strong. Go there. If navigating your way through a forest bathing experience on your own feels overwhelming, there are many organizations around the world that offer guided experiences. Check out the Association of Forest and Nature Therapy to discover a program or guided opportunity in your area. This deeply healing spiritual practice is emerging as a growing community of friends and activists making a global impact. As more and more people learn to love and relate to the trees in the forest, humankind is become more engaged in working for the forests’ well-being.